The Startup vehicle Dilemma – LLC vs. Inc – what to pick? I was talking recently to a newly minted entrepreneur who had formed an LLC and was working to secure a round of funding using the LLC as the investment vehicle. Unfortunately, experienced angel investors and venture investors do not invest in LLC’s, they only invest in C corporations (the “Inc.” in our title). Why is this? Because they are well acquainted with C Corporations. Moreover they only want to invest in C corps which are incorporated in Delaware! At first I could not believe this, but “venture attorneys” (those experienced in startup funding) all confirmed, investors want a Delaware C corporation. Why Delaware? Delaware has a well defined set of court decisions about corporations so Delaware corporate law is well understood by investors. They don’t want any crazy state law governing their investment. The investors desires, of course, “eclipse” any concerns you might have, so, picking Delaware C Corporation it is, pretty straightforward right? Well, not so fast. In the earliest days of the company, particularly while you are getting started and raising money, a C corp makes NO SENSE! C corporations are much more complex than an LLC, particularly in the earliest days. An LLC makes sense as the losses can roll over to the owners’ tax returns and blunt the challenges of funding the early costs, the documentation and tax filings are much simpler etc. So what should you do when forming your new venture? Our attorney for DoBox identified a simple solution. Incorporate as DoBox, LLC at first. Then, when the round of funding had come together, create the Delaware based C corporation and “pour over” everything from the LLC to the C corporation, THEN finalize all the documents and the investment with the C Corporation. Given that the funds all come into the law firms escrow account before being transferred over, everything worked out perfectly. So, what should you choose? Both! P.S. Make sure you get an experienced venture attorney. See our post Building Your Startup Team – Lawyers, Accountants and Providers – Oh My! for more insights. 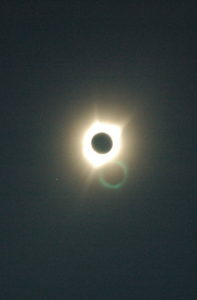 P.P.S Hats off to teenage photographer C. Davis for this awesome shot of the total solar eclipse from Idaho!